Using the mini golf app as a player is great - an easy to use score card with beautiful pictures of holes and help on how to play each hole. That's a nice service to be able to offer and enhances the playing experience with player tips and route animations. That helps bring players back in its own right, but as a course operator you want to know how can this app actually make you money, how can this pay for itself and then some, right? I'm not going to mention social media or push notifications now - we will save the likes of Facebook, Twitter and Instagram for another day. I'm taking you back to school. Yes, lets start with Email. Plain old fashioned Email, remember that? Not a single #Hashtag necessary! After customers have downloaded the app you will ask them for their name and email address if they want to join your reward/loyalty scheme. Once you have that you can send them a welcome email. As the word spreads and more players download your brilliant app and register, you will soon find yourself with a large number of email addresses. Yes you have got yourself a good old fashioned email database. 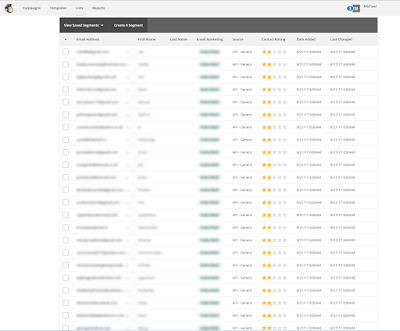 The data page shows all of your registered users - not just the names and addresses but also you can see the number of rewards points they have accumulated. Alongside reward points there is also a strange field called DeviceID. More of this too in a future post, but we manage to tie in email addresses with their unique phone identifier. This means you can send push notifications not just to everyone, but to targeted customers. From the web portal you can export all the emails or maybe you want to target those players with the most reward points, or maybe those with the least? Maybe you want to send a newsletter out, maybe you want to send an email out saying you are having a double reward points weekend. What you do is down to you, but regular communication with your players is key for repeat business and some extra sales. 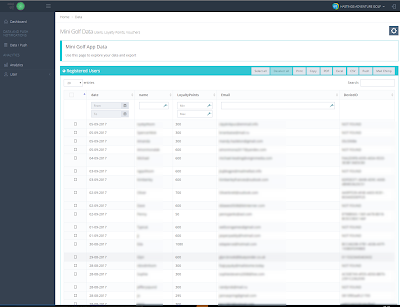 The app provides a great mechanism to start collecting email addresses. The admin portal provides easy buttons to export your email list as a standard excel, csv or pdf file. A new feature we have just added is the ability to send email addresses directly into your MailChimp account list. As it says on their website - MailChimp, is the worlds largest marketing automation platform. Millions of customers use MailChimp to reach their customers through email and grow their business. If you have a MailChimp account we have made it super easy for you. Just select the email addresses you want to export and enter your MailChimp List ID and as if by magic those email addresses will appear in your MailChimp List. You can use that list to send out your newsletter with your MailChimp template. It's as easy as that. Happy Emailing or perhaps I should say..
Hastings Adventure Golf, one of the first mini golf courses to use mini golf app, asked if we could build them 'something' that would allow their players to be able to take a selfie within the app which could then be uploaded to social media channels. Selfies are not a new thing, but it is not a fad which is going away either. Using Selfies as a marketing tool is a well known business growth strategy and there are plenty of references on the internet if you google it. People love taking pictures of themselves. Young adults in particular are addicted to selfies. But most important is that selfies get shared a lot. They get shared not only between family and friends, but also on social media. Facebook, Twitter and Instagram. All this sharing will indirectly promote your businesses and raise awareness. Players are already enjoying themselves in a fun environment, often with friends or family. They want to take selfies anyway. So harness this enthusiasm and make it easy for them. 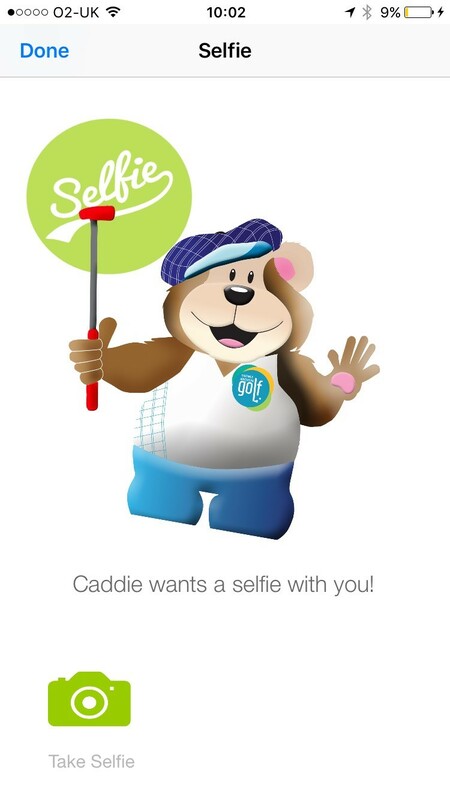 Provide 'selfie spots' around the course which will provide a natural back drop for a selfie. This will remind them to to take a selfie, as well as show your course off to its best advantage when that selfie is shared with hundreds of people on Social Media. Just taking selfies is great, but having a selfie feature in an app is even better! You can include your course logo and or your course mascot in the selfie. You can include reminders in the app to take a selfie and you can even offer reward and loyalty points if people share their selfie. You can run competitions for best selfie of the week/month etc etc. So with just a little effort you can really use the power of the selfie to promote and expand your customer base. Do this well and watch your traditional advertising costs shrink! This is just one of the many ways your mini golf app will give you a return on your investment. 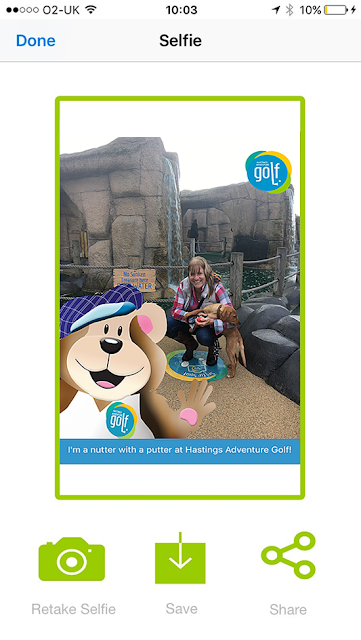 Here is our implementation of our Selfie feature for Hastings Adventure Golf . 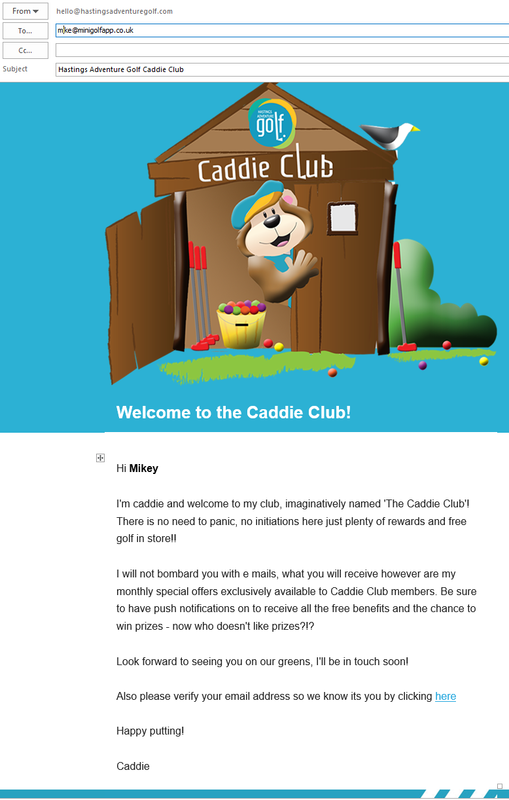 Of course we can brand and customise the selfie feature for your individual mini golf app. 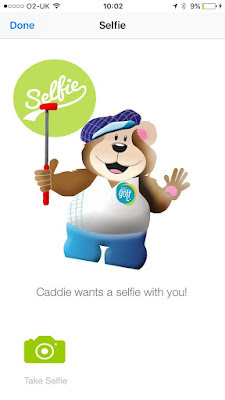 Caddie, the Hastings Golf course mascot pops up on the app when you reach a Selfie Location. 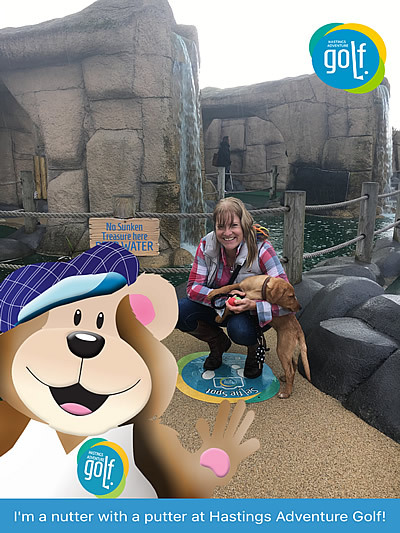 (Hastings Adventure Golf have a selfie location on each of their three courses). You don't need an explicit selfie location, but we think it adds a nice touch. Check out the huge selfie location sticker in the photo below. A Selfie spot at Hastings Adventure Golf. Take the Selfie. In fact, we have given the users the option to use the front facing or rear facing camera . It's hard to take a true selfie with a puppy!! Also note you can take a selfie in portrait mode or landscape mode (great for groups of players). Hastings Adventure Golf show their mascot, their logo and a strap line. Once taken, there are options to save the picture to your phone or share. You can share via text message, email or social media. Here we are sharing with facebook. 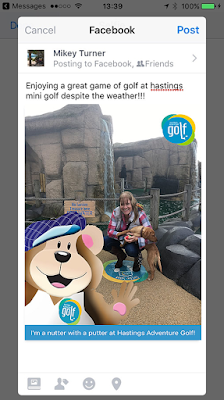 Go viral with your mini golf course - let the mini golf app help you with your marketing (for free)!